Tag Archive | "horse barn"
Should horse barn be torn down? I’d like to say thanks to the Post for the coverage of stories in Solon Township, including the article in the July 21 edition about the Solon Township Board decision on July 12 to table action on the proposed removal of the huge horse barn on Algoma Avenue. Since attending the July 12 meeting, I have spoken to dozens of Solon Township residents who feel that the barn should remain, be maintained and utilized. I would encourage Solon Township residents to stop by the barn at 15185 Algoma, walk around and through it, and then show up on Tuesday, August 9 at 7:30 p.m. at the board meeting at the Solon Township Hall and let the board know what your thoughts are on this matter. About 20 people attended the Solon Township board meeting last Tuesday, July 12, to voice their opinion on why a horse barn on township property should not be pulled down to make room for a new township hall. 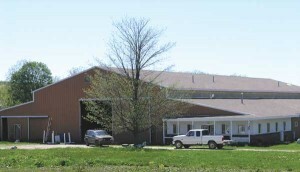 At the meeting, the board decided to table action for authorization of the sale and removal of the barn. They approved preliminary plans last fall for the construction of a 6,000 square-foot building with community room, at a cost of about $750,000. Solon Township Supervisor Bob Ellick said that they had not yet seen the site plan, though were told it was complete, and would not act until they could review it. He also feels that if they wait a couple of years, they would be in a good financial position to pay for it without financing any of it. “Our revenue sharing went up substantially, but these are still tough economic times,” he said. “Why rush it?” He noted they would still need to pay for heat and electricity for the current building, which also houses the fire department. Currently the pole barn is being used to host a farm, craft, and flea market every Saturday during the summer, at no charge to vendors. The originally thought they might be able to convert it into offices or a new fire department, but an engineer told them it would be cost prohibitive to do that. “We could probably sell it through an auction,” said Ellick. Solon bought the 19-acre horse farm at 15185 Algoma two years ago in a tax foreclosure sale for $28,378.